I made it back from the New Jersey Hot Dog Tour none the worse for wear and delighted to have met such a great group of true hot dog aficionados. I arrived at the first stop, Galloping Hill, an hour before the buses showed up- I was that pumped! Once people started arriving, I circulated amongst the crowd, doing my Hot Dog Stories thing. There were six stops on the tour, so I did NOT visit my 100th spot. Be on the lookout for a special, 100th Hot Dog Story in the near future. I am currently sorting through the several hours of video footage I shot and I'll be making a video that documents the entire experience. I had so much fun, I am going to do my best to return next year for the 10th tour! Great meeting you Rob even if is was only a min or two. 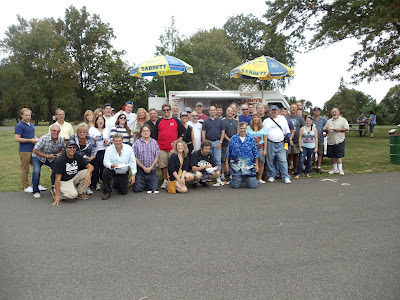 Looking forward to seeing your video of the NJ Hot Dog Nation Tour you seemed to do a very good job of it. Watch out for this guy in a few short mins that I know him he was already holding hands with my wife taking pics. lol your welcomed back to NJ and my truck anytime your in the area. < and that's coming from a Yankee Fan imagine that.